Tomb Raider Video Slot Guide & Review - Casino Answers! Tomb Raider is a 5-reel, 15-line video slot found at Microgaming-powered casinos. It has a bonus game, free spins, scatter wins and wild symbols. 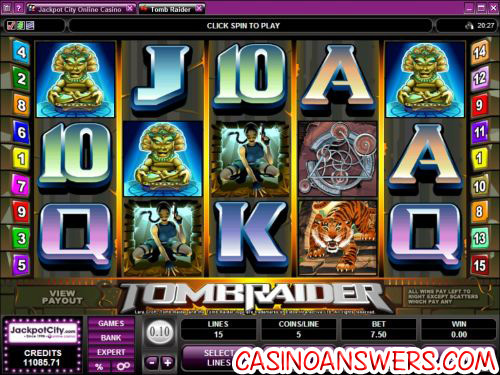 You can play Tomb Raider at All Slots Casino and Jackpot City Casino. The Tomb Raider video slot is a branded video slot based on the Tomb Raider action-adventure video game franchise. The popular Tomb Raider franchise has also spawned a film starring Angelina Jolie as Lara Croft. Croft was acknowledged as the Most Successful Human Videogame Heroine in 2006 by the Guinness Book of World Records.Play at this years #1 online casino for United States - Slots.LV. To start playing the Tomb Raider slot machine, select a coin value. Coin value denominations are $0.05, $0.10, $0.20, $0.25, $0.50 and $1. 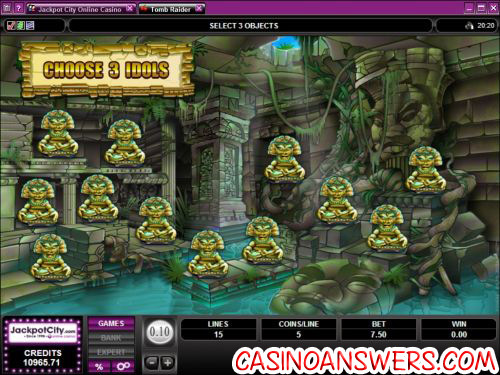 Once you have chosen a coin value, you must choose how many coins you want to wager per spin (up to 5). Also, make sure to set the number of paylines you wish to have active (up to 15). Once you have set these values, you can hit the “Spin” button to start playing. Tomb Raider has a free spins feature. If the scatter symbol appears on the reels 3, 4 or 5 times, you will win 10 free spins with a 3X multiplier. All bets and lines played are the same as the spin that triggered the free spins. Free spins can be re-triggered during the free spins feature. The wild symbol in Tomb Raider is the Tomb Raider logo. It substitutes for all of the symbols except for the scatter and bonus symbols. The wild symbol also makes for the top jackpot in the Tomb Raider video slot. It is worth 7500 coins if you can manage to get five in a row. The wild symbol does not multiply payouts. Switch Tomb Raider to expert mode and you will enable the autoplay feature. You can choose the number of spins (5, 10, 25, 50, 100, 250 and 500). Stop settings included are to stop once all of the spins have been completed and to stop if a win exceeds or equals $25, $50, $100, $250, $500, $1000 or $2500. Unfortunately, you cannot input your own value for an unknown reason. There are also quick buttons to autoplay 5 or 10 spins. You can stop the autoplay spins at any time. Can US players play the Tomb Raider video slot for real money? Microgaming casinos are not open to American players, thus they cannot play the Tomb Raider video slot for real money. Slots players who enjoy video games will love the interactive iSlots at US-friendly Rival Gaming casinos such as Vegas Days Casino. Does Tomb Raider have a progressive jackpot? Tomb Raider has a top fixed jackpot of 7500X, but no progressive jackpot. If you are looking for an excellent Microgaming progressive jackpot, please read our Mega Moolah Progressive Jackpot Slot Review. Is there any video game slot machines?